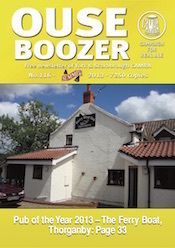 This entry was posted in OB116, Ouse Boozer, Ouse Boozer Magazine on 28th May 2013 by York CAMRA. 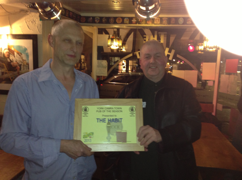 On a windy and rainy March night a group of us met at the Habit to present Simon and his staff with the Spring Town Pub of the Season. This little bar in Goodramgate provides a little oasis serving two cask ales, one always a LocAle. On presentation night Treboom Baron Saturday was the beer of choice and in fine fettle it was too. Simon and his staff have worked very hard over the last few years to build a free trade business in a listed building. Listening to customers, one hand pump was installed and slowly people got to know about it leading to a second hand pump as demand grew. Simon’s plan for this year is to install a third hand pump, a tight squeeze but as Simon says a challenge! Real cider is now also a regular feature with Moonshine being the most popular though others do make the occasional appearance. This entry was posted in OB116, POTS, Presentations, Pub News and tagged Habit on 28th May 2013 by York CAMRA. 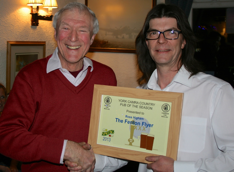 Eighteen members journeyed out to the Fenton Flyer in Church Fenton for an evening presentation of the Branch 2013 Spring Country Pub of the Season award in March. On a dull evening, with snow threatened, many locals welcomed us to a warm pub to what had been a well-publicised social event by landlord Ross Higham. There were three LocAle beers on offer as well as John Smith’s cask and Sharps Doombar, their permanent replacement for Tetley Bitter. The three guests beers were Ossett Yorkshire Blonde (later replaced by Ossett Silver King), Roosters Yankee and Brown Cow Captain Oates Dark Mild. The presentation was made by the sponsor, John McCloy. John said that he had been a frequent visitor to the pub from the time when it was a Mansfield Brewery pub and had watched its rise and fall and how encouraging it was see the improvement of this village pub from the previous times with the arrival just over a year ago of the enthusiastic landlord. It was good to see that it was possible to sell guest beers alongside nationals. The pub was very much a community pub arranging frequent brewery visits and charity quiz nights and was obviously now a great asset to the village. In making the presentation, John congratulated Ross on his enthusiasm and for his efforts and hoped it would keep going for the foreseeable future. Ross thanked CAMRA for the prestigious award and all his locals for the support given to him during the time he had been at the Flyer. He also said that mention in the previous Ouse Boozer of the young man who had taken the pub was a surprise and had resulted in some friendly banter from the locals. Opportunity to sample more of the beers followed before refreshments in the form of locally sourced pie and peas and chilli and chips were served. This entry was posted in OB116, POTS, Presentations, Pub News and tagged Fenton Flyer Church Fenton on 28th May 2013 by York CAMRA.